Hello darlings! I hope you all had wonderful holidays and that you’re having a great new year so far. Mine was really good, I just feel like they flew by so quickly but I’m not complaining. I am very excited for 2015 and looking forward to a lot of things! I have so many ideas in mind for future projects and I cannot wait to share them to you. To kick of this new year, Rite Aid has an exciting promotion where you can earn rewards for the purchases you make at your local store and online at riteaid.com from December 28th of last year until the 24th of January 2015. For every $50 you spend on participating product purchases, you can earn a Unique Reward Code up to a total of 5 codes or a $250 spend. Then redeem your Unique codes at riteaid.com/youyear for your choice of exciting rewards – from a night out bowling to a 7-day resort stay. Purchase participating products at Rite Aid or online at riteaid.com with your wellness+ card between December 28, 2014 and January 24, 2015. Click here to see participating products or look for a shelf sign in store to see which items will count toward your rewards! For every $50 you spend, you will receive a Unique Reward Code on your receipt. Check your register receipt to see how close you are to receiving a Unique Reward Code. 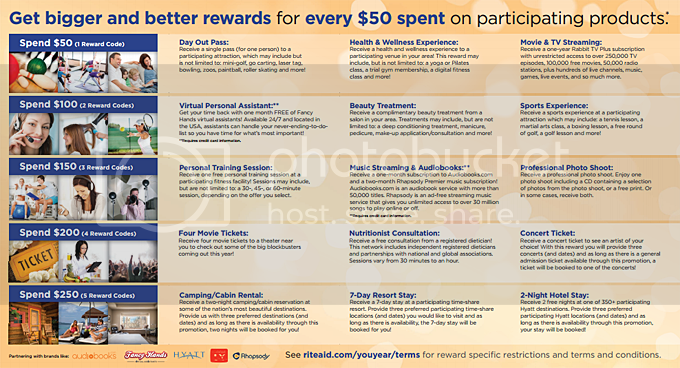 Create your account on the Sign Up/Log In page [riteaid.com/youyear], add the Unique Reward Codes you received on your receipt, and redeem your credit towards rewards! Please remember that your Unique Reward Codes and credit on your account will expire at 12:00AM PT February 25, 2015. After that point you will no longer be able to redeem rewards. Don’t these rewards sound super awesome? Definitely a great way to start this year! What reward are you aiming for? A concert ticket, 7-Day Resort Stay or a Two Night Hotel Stay would very nice! *In-store and riteaid.com purchases with wellness+ card between 12/28/14 – 1/24/15 is required. Reward is valid while supplies last and is subject to promotional availability. Void where prohibited or restricted by law. Limit of one (1) redemption per reward category per customer name/email address, (1) per household, one (1) per booking group. Reward credits acquired through purchase (or received through twitter or blogger promotion) are limited to 250 credits (5 Unique Reward Codes). Only one Unique Reward Code received outside of purchase is allowed per account. The value and types of rewards will vary dependent on the geographic location and vendor fulfilling the reward. Unique reward codes and credits towards rewards shall expire at 12:00AM PT February 25, 2015. Additional reward specific restrictions as well as promotional terms and conditions apply. See riteaid.com/youyear/terms for complete details. The Rite Aid Lip Look Challenge!